Parliament is supreme legislative body which has been provided by the constitution the power to make laws for the Union of India. It is the functioning of this apex legislative body which allows the country to run smoothly. Time again we have been hearing through the mainstream media that the parliament could not function to its best during a particular session or the previous session was a total wash out because of ruckus created by opposition members. It is since the advent of Narendra Modi Government in 2014 that disrupting or stalling of this apex legislative body has become a part of mainstream discourse to a very large extent. Making of laws is a complex process which requires expertise, technical knowledge and awareness of need of people. Parliament of India comprises of two house and a law to become enforceable it has to be passed through both the houses of the parliament. If any house of the parliament is not allowed to function or compelled to be in such a state that it is unable to work it is the general public which suffers. It is very unfortunate that the people who elect members to parliament suffer because of political stunts, animosity and to gain political numbers. 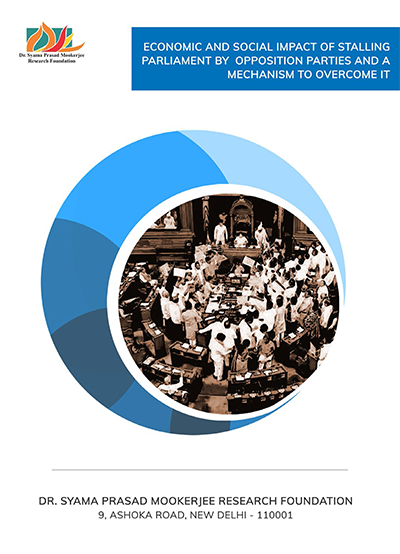 Through this report the authors have provided a graphical representation of the time lost due to such stalling, its impact on the public at large, solutions to curb this menace while keeping the constitutional privileges of the elected members intact and a comparative analysis of how this problem has been curbed by various countries across the globe.